In the last two years, AMDA alumnae Theresa Murray and Julie Furrer both received full scholarships to dance with the esteemed Jacob's Pillow Dance Festival. The festival takes place every summer in the Berkshires in Western Massachusetts and it is recognized worldwide as a "hub and mecca of dancing" (TIME Magazine). It offers training to dancers with the opportunity to interact and work with top dance companies and choreographers, over 200 free performances, speakers and a range of events. Dance icon, Mikhail Baryshnikov, called it "one of America's most precious cultural assets." The Jacob's Pillow website states, " 'The Pillow' is a treasured 220-acre National Historic Landmark, a recipient of the prestigious National Medal of Arts, and home to America's longest-running international dance festival." One might simply call it the premiere cultural center for dance. After hearing such rave reviews about their experiences at Jacob's Pillow from both alumna, we wanted to give our AMDA graduates some insight into what the program is like and how to go about applying for a coveted spot. Please note that the program is costly, however there are opportunities for scholarship, and most of the performances are free to visitors. How did you hear about Jacob's Pillow and when did you decide you wanted to go? I gained familiarity with Jacob's Pillow through many dance publications such as Dance Magazine, Pointe Magazine, and Dance Spirit and through my sister who is also a dancer. I first saw the stunning pictures taken of legendary dancers performing in the Berkshires of Massachusetts. It was at Jacob's Pillow that world-renowned dancers as well as dance companies would create and/or premier new works to critic's acclaim. Jacob's Pillow seemed to me to be "the Mecca" of dance. I learned that Jacob's Pillow was not only a National Historic Landmark but it was also an institution that multiple college students/ pre-professional dancers would attend to train and refine their craft through a 3-4 week summer intensive. They offer programs in ballet, contemporary and world dance. I was personally thrilled to learn about their Jazz/Musical Theatre Program directed by Tony award-winner, Chet Walker being offered! With this new discovery, I knew I wanted to apply. Tell us about your audition and application process? My audition experience was most likely the most positive audition experience that I've had to date as a professional performer. After filling out audition paperwork and turning in my headshot/resume, the Director of Education, "J.R." Glover, began with an introduction of Jacob's Pillow as well as the school. She explained (as the audition notice also described) that the auditions for the summer programs offered at the School at Jacob's Pillow were simply master classes. We began with a slate introduction and the "audition" was led by an AMDA LA faculty member, Kim Hale. *This was a wonderfully validating moment. It was incredible to know that in gaining an education from AMDA, I was put into a position of being familiar with or at least being knowledgeable of working professionals (AMDA faculty) in prestigious circles. 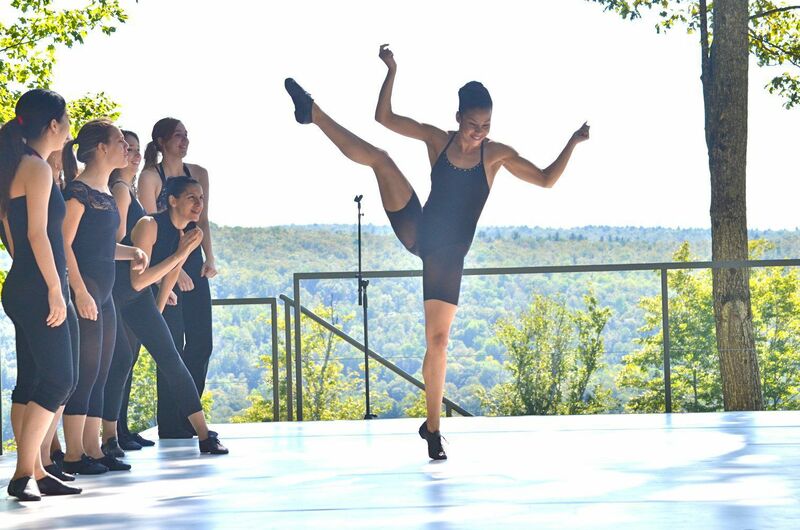 The "audition" lasted about two hours which included warm-up, across the floor progressions, two combinations of contrasting styles, a 16-bar presentation (accompanied by additional AMDA pianist, Matthew Smedal), feedback, constructive criticism, encouragement, and a closing video of opportunities offered at Jacob's Pillow. What was the experience like, whom did you get to work and dance with? The experience of training and performing at Jacob's Pillow is phenomenal. You literally eat, breathe, and sleep dance while studying at the Pillow. On top of training with focused, talented, passionate dancers from all over the world, you work with the best directors, choreographers, and musicians in the business learning an iconic repertoire as well as having brand, new works set upon you. I studied with vocal teachers Teri Raulston (AMDA faculty), Ric Ryder, and Andy Gale. I performed with musicians John Fischer (AMDA accompanist and director of Broadway's Rising Stars), Dan Gross, Jeremy Clayton, and Saadi Zain. In a final performance of A Jazz Happening, a benefit for The School at Jacob's Pillow I performed with Malcolm Gets, Marc Kudisch, Shannon Lewis and WALKERDANCE company members: Emanuel Abruzzo, Andrew Fitch, Philip Northington (AMDA alumnus), and Joshua Schulteis. What were the unexpected benefits of being a part of it? The most unexpected benefit of attending Jacob's Pillow came 3 days prior to flying to Massachusetts. I received a phone call from the Director of Education, J.R. Glover, informing me that I was selected as the 2012 recipient of the Lorna Strassler Award. Out of hundreds of dancers from around the world that audition and apply to hopefully spend the summer training at the infamous Pillow, out of all the classical, contemporary, tap, and world dance programs, I was chosen for this prestigious award. J.R. informed me that my tuition had been paid in full and that I was to be presented with $2,500 check at the School at Jacob's Pillow benefit show. Why do you recommend it to others? I recommend both studying and/or visiting Jacob's Pillow for the truly eye-opening experience that it is. It was an honor to be in a place that held such an extensive history and legacy. The patrons, students, interns, faculty, traveling dance companies, and staff all view dance with a great love, respect, and admiration. In addition to the training that the School offers, it is at Jacob's Pillow that visitors can not only view elite performances, but also take open classes; educate themselves though Pillowtalks with celebrated choreographers, writers, and historians, plus, visit the Blake's Barn Archives building which houses multiple exhibits, books, films, and costumes. *Jacob's Pillow is not only a National Historic Landmark, but in 2012, President Barack Obama awarded it the National Medal of Arts. Do you have any specific moments that stand out for you? There are many moments and memories that stand out greatly from my summer spent training at the Pillow, but I must say performing in the historic TedShawnTheatre for the benefit performance was truly an incredible experience. The culmination of three demanding weeks spent working with highly esteemed teachers, performers, directors, choreographers, and musicians was very rewarding. Also, accepting the Lorna Strassler Award and presenting my acceptance speech before the House was surreal, scary, humbling, but all together extraordinary. The grand gesture that this award was and still is touches me very deeply to this day. What else should fellow AMDA students and grads know? What I wish to share with current AMDA students as well as my fellow alumni is to trust the education acquired while studying either on the East or West Coast campuses. As a professional in the industry, I feel it is important to always maintain the heart of a student who wishes to constantly learn new things. I was incredibly fortunate to have the opportunity to continue to study my craft at Jacob's Pillow in addition to graduating from AMDA. From my audition, to submitting my letter of recommendation, to the training itself in Massachusetts, several professionals with ties to AMDA guided my path. Not only was it comforting, but it was also a great affirmation that the institution I chose to attend is relevant, current, and still continuing to help me achieve my goals professionally.